Like the film’s undisguised influencers, 2001: A Space Odyssey, Solaris, THX 1138, Blade Runner Duncan Jones’ Moon uses the genre of science fiction to examine the humanity deep inside us all. It's a marvelous film which unfolds from the point of view of its single character. If you haven't seen it, I advise reading this review after, because, although it's always best with any film to go in without any pre-conceptions, in this case, its especially important. But just in case, I've kept this review as spoiler-free as possible. 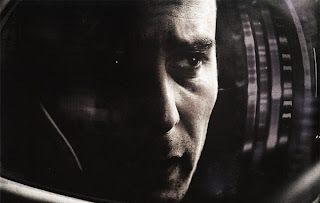 Sam Rockwell gives a marvellous performance as Sam, who for three years has been stationed on the Moon farming helium and sending it back to the earth for energy. He's been working diligently in solitary for three years, with his only companion his HAL-like computer Gerty (voiced by Kevin Spacey). His contract is almost ending and he greatly looks forward to reuniting with his wife and son. Three years in soltary is enough to make anyone bonkers and by the end Sam is a wreck, teetering on a psychological breakdown. After an accident with one of his lunar buggies, Sam comes face to face with a hidden secret about his mission eventually revealing an emotionally shattering truth about his own existence. Director Duncan Jones' enthusiasm for humanity brings great warmth to the film's cold and detached environment. As told to us by the opening sequence, the helium mined on the Moon has been a saviour of the environment on earth. Once Sam starts questioning his mission there’s opportunity for him to weigh the altruistic nature of his mission - the importance of one man to humanity as a whole. Jones never lets Sam acknowledge this perspective. And it’s consistent with his point of view – the individual perspective, the importance of individualizing Sam as his own being, not a robot, or an indentured slave to humanity. By using the visual language of the film’s genre predecessors Jones doesn’t need to off the moon for context. If you think really carefully, a few logical holes appear, and some narrative conveniences. But since we know how communications work in the movie version of space, or the motivations of nefarious corporations in science fiction films, this is all we need to suspend our disbelief. The octagonal architecture of the base is lifted directly from 2001, same with the industrial clunkiness of the machinery straight out of the Alien franchise. Fit these visual cues into Andrew Niccol’s triumph of the human spirit in Gattaca and George Lucas’s dehumanized hero in THX 1138, and you have a wonderful homage to the best of these films. And of course there's Gerty, the computer which operates with the same monotone false companionship as HAL. Jones uses this familiarity to his advantage generating a blanket of tension just by his mere presence. Clint Mansell, delivers his best score since Requiem for a Dream, a lovely piano-based theme which runs throughout the film evoking interminable sadness and melancholy. Mansell never threatens to go over the top, because for Sam, his personal discoveries are existentially monumental and earth-shattering. Sam Rockwell has always been a hit and miss actor for me, often chewing scenery with his physical ticks and mumbling manner of speech. But hands down Moon is his best role, an intense and focused performance, which allows him to use his unique mannerisms for the betterment of the character and the film. There are many people who hate this type of science fiction, and admittedly a film like this wears its heart on its sleeve, a metaphorical romanticism of the soul. Those naysayers be damned, Moon is a wonderfully optimistic and glorious piece of cinema. Enjoy.